Tasting with Stephan von Neipperg is always one of the highlights from my Bordeaux tasting trips. He is erudite as well as funny. His views on Bordeaux wine, winemaking and the care of the vineyards is unique, as well as refreshing. For Stephan, Bordeaux wines are made in the vineyard. He practices organic farming techniques that enrich the soil. Healthy vines and soil, produce the best wines. 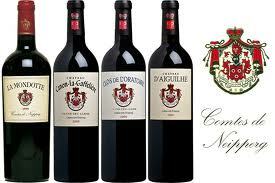 Some of the regular practices promoted by Neipperg are; no pesticides of any type are used. Vines are regularly earthed-up to promote aeration. The soil is not ploughed too deeply so as not to mix the two layers of topsoil. Organic compost, naturally low in nitrogen is used in carefully controlled quantities that add nutriments to help the soil regenerate itself (thanks to compost containing worms, bacteria, etc.). Cow manicure is mixed with straw and this is ready to use after 9 months. The topsoil’s low density is compensated by the regular addition of clay.